Continuing in the Audioscape room on the 8th floor where I saw the PrimaLunas and Ushers, the Usher Mini X Bookshelf speaker ($3995) was the first pair in North America, I was told, and it is available in Pioneer Birch (not birch bark), walnut and maple, so there will be some flexibility for d�cor. Moving down the hall to the Cabasse room I had a chance to hear the new Pacific 3 SA ($22,000) floorstander in the Artis series from this French manufacturer. It features the new BC17 17cm coaxial drive unit, but unlike many (if not most) Cabasse speakers, this driver is encased in a more conventional cabinet with an inverted honeycomb dome woofer mounted above and below the BC17. Not completely conventional, the cabinet features sweeping top to floor sculptural lines that play very nicely with the light to give the speaker a more elegant and formal look that would be more at home in a traditional setting than most Cabasse speakers. The SA version has powered woofers, while a passive version is available at $16,000. Both come in gloss black or gloss pearl (white). The electronics appeared to be two separate rigs, one Esoteric with an A-03 Class A stereo power amp and C-03 line stage preamp fed by the new K-05 CD player with VRDS Neo transport and the other a Teac rig with CD player and integrated amplifier. The higher brand Esoteric gear was playing when I was in the room and the music was very transparent and crisp as you would expect from gear at this price level. Stepping down to the non-powered version of the speaker and the Teac components would drop the price considerably, with only a modest sacrifice in quality, I suspect. A male vocalist with a chesty voice was playing guitar on one piece of music and a soft female jazz vocalist on another, so it was difficult to get a complete grip on the sound of the system. The female vocalist was a bit "essy" so it could be that the speakers were not fully broken in, but it was certainly a very good if not one of the Best Rooms at the show. It was a pleasure to meet Bernard Li again in the Charisma Audio room. 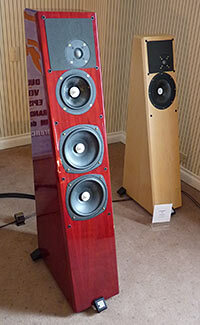 It was a beehive of activity at the time with great sound coming out of tall red framed full-range P 3.1 electrostatic speakers from Audio Exklusiv ($15,999), a German company with a full range of products. Also from Audio Exklusiv was their P 2 solid state phono stage ($7599) with a complete range of settings from dials on the front, their P 7 tube line stage ($7999) shown here, and a pair of P 14 hybrid monoblocks that put out 300w into 4 ohms ($18,499). Power was filtered through a GigaWatt PC-4 EVO power conditioner from Poland ($10,299), but the photo here shows the beautiful inside of the more affordable PC-3 SE EVO ($7,799) with lots of polished silver plated metal inside. 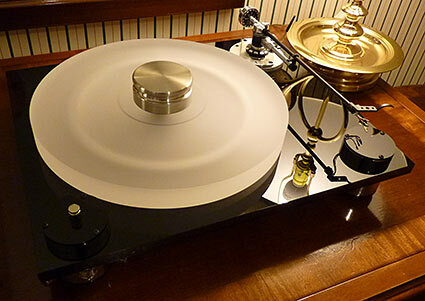 A Well Tempered Lab Versalex turntable with LTD tonearm was on the equipment rack ($4975), but not playing at the time. It was equipped with an EMTJSD6 Super Fineline MC cartridge ($3299) that I had never seen before. On the digital side was a Shanling Reference CD-500 tube CD player ($5999) with its signature blue back lighted highlights, and a Calyx Femto Reference DAC ($7200) which was the Big Brother to the Calyx 24/192 DAC I picked up for review last year at this show. The 24/192 has garnered rave reviews over the past year and the music here was excellent, from what I could tell with all the commotion. But as I examine my video notes I see that neither the turntable nor the CD player were in motion, so I'm not sure what was the source of the music. A hidden server? Other goodies in the Charisma room included the beautiful Audio Space Reference One tube monoblocks ($29,219) and the simple but very elegant Scheu Analog Cello turntable with a vintage Black Widow tonearm to complete the picture. At $1549 without the arm, this German turntable looked to be a good value, especially considering the company it was keeping in this room. Phil Gold reviewed this turntable back in 2008. 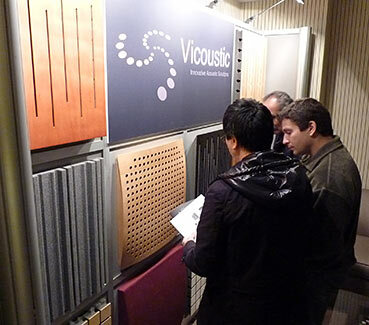 The Vicoustic wall panels behind the equipment racks and on a separate side wall were receiving a lot of attention from visitors. They range in price from about $60 to $90 per square and were comprised of a finished hard panel on the front and a 2" layer of foam on the back. The freestanding panels behind the racks had plywood on the back sides so they could act as room dividers also. The panels are designed to both reflect and absorb sound to control vibrations without causing the room to go completely dead. This was very similar in concept to the panels used by Roy Gregory in his audio tweaking seminar I heard later in the show. The panels are available in a wide array of finishes and types for studios, performance halls and of course audiophile listening rooms. I expect in Canada, where so many people live in apartments, these are important accessories. The Reference 3A room has a pair of Episode-B speakers ($5500) in satin maple finish on silent display and the flagship Grand Veena-B model ($7995) in gloss cherry finish playing music at the time I visited. These were not "B-stock" � the "B" stands for the new Beryllium dome tweeter in these models that extends the frequency response to over 40kHz. 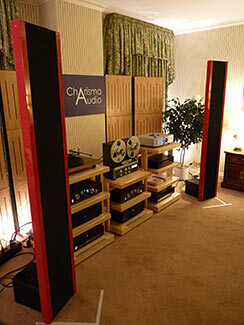 They were powered by a new Copland CTA 506 tube amp ($6500) featuring KT120 tubes in ultralinear configuration. 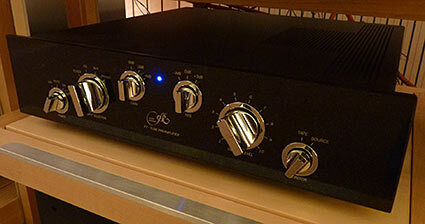 The signal was from a top loading Copland CDA 825 CD player ($6500) I hadn't seen before, nor the CTA 305 preamp ($3495). Tash Goka had put together a very simple, straight-forward system that proved to be one of the Best Rooms at the show. New to his speakers at this show was the patented "Surreal Acoustic Lens", a white diffusion cap seen here on the woofer and mid-woofers to improve dispersion. He has added this at no upcharge to all the cone drivers manufactured by Reference 3A. The entire line has consistently drawn rave reviews and this room showed exemplary focus, transparency, dynamics and most of all listenability with ease and believability of the musical performance. It is hard to remember back a year when I heard them last, but the presentation here was easily the best I have ever heard any speaker from Reference 3A. In the Audio Excellence room Cary Audio and KEF speakers teamed up for a very fine sounding room. 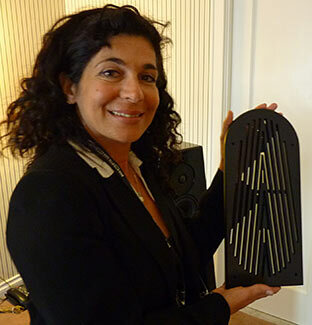 The flagship KEF Blades ($32,000) which premiered earlier this year were on silent display, but the coaxial driver technology from the Blade had trickled down to a $1500 single driver monitor and the KEF R500 full range floorstanders ($2799) which sounded quite good. 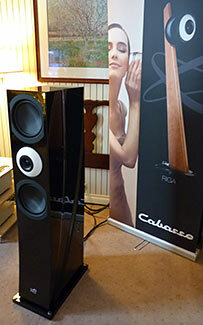 They were driven by a Cary SLP-03 tube preamp ($1995) feeding a Cary CAD 120 tube power amp ($5795) putting out 120 wpc. The source was a Musical Fidelity M3 CD player ($1680), making for a moderately priced rig that would be easy to recommend at its price point. You could also choose to go the home theater route with the KEF R 200 C center speaker ($999) and R 300 bookshelf speaker ($1990/pr.). Also on display was a Cary HH1 tube headphone amplifier ($1595) lending evidence of the surge in interest in headphone listening. Even I have fallen victim to the trend as I was forced to borrow a set of Grado cans from my friend Tom to listen to my video notes as I write this report. I could get used to this idea. In the Audio Note UK room there was a complete Audio Note rig as you might expect, complete with their ported speakers placed in the corners. The electronics were factory built here, unlike the kits for sale in a booth down on the 2nd floor. If I told you the prices of this stuff you might well consider investing in a good soldering iron. Not just to save some bucks, but to own something you built yourself that produces excellent music. They do kits for the speakers as well as the electronics. While the room had the air and bloom typically associated with tube gear, it was crisp and detailed and extremely involving. The rig was comprised of a CD 4.1x CD player feeding an M2 Line preamp which was driving Empress Silver monoblocks which are a 2A3 parallel single ended design putting out about 8 watts each. Others might have heard a stereo amp with 211 tubes that was also on the floor, a model I didn't recognize. Eli and Ofra Gershman were both in their room when I visited Gershman Acoustics. Such is not always the case. I was greeted with smiles from both and proceeded to admire the often displayed Black Swan speakers that were playing. Pass amplifiers and a PS Audio digital front end were connected by commensurately priced Siltech cables. In recent years this venerable model has always sounded excellent, but that's old news. On cue, we all stood up and turned out chairs 90 degrees to face their new Idol, a much more affordable floorstanding two-way ($3000 versus $45,000). The Idol incorporates a special variable regulation transmission line to bring about a deep, focused and detailed bass. The 1" soft dome tweeter is mounted below the 6" woofer and the 46" tall speaker has a small 10" x 10" footprint. The larger system came in at $136,000 while the small one totaled $18,000 � but $6000 of that was for the excellent Esoteric K-07 SACD player. Had they used the Cambridge Azure 651 CD player ($879) the price would have been more realistic � not to fault the Esoteric model in any way, but the Cambridge CD player would have been more in line with the Cambridge 651A integrated amp they were using. Expensive cabling from Siltech, Gutwire and even Gershman's own power cord worked the price higher than the Idol speaker will likely see in the real world. Three seconds into the music a smile came to my face as I realized this speaker was going to be a real winner for them. So maybe the speaker really does deserve the good cables, but shop around. The other interesting news was the grilles for the speaker � cut out of a thin sheet of wood, which doesn't muffle the sound like the cloth grilles most commonly seen. Kind of retro � like on the old console radios our grandparents had�or great grandparents as the case may be. I'd call this one of the Best Rooms for each of the rigs I heard here, each in its own price range.